Every project, regardless of its size or complexity must have a plan to succeed. As part of that project plan, a comprehensive and manageable project schedule is needed. Planning and scheduling projects in a systematic and logical fashion is paramount to the success of an overall program. 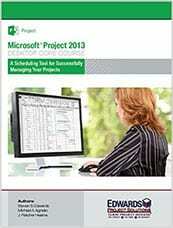 This hands-on training manual provides a clear, comprehensive, step-by-step methodology for setting up, entering, managing, and tracking a project schedule using Microsoft Project 2013. The product includes: A professional bound 500+ full color instruction manual that is rich with color screen captures and process details that provide step-by-step management processes. Additional training course material includes: A laminated desktop reference illustrating step-by-step workflow processes, a CD containing Microsoft Project Macros and add-ins written by Edwards, custom tools, templates, “check-point” project schedules from the course, and sample schedules and exercises.